Find out why these smooth, level surfaces have triumphed over their predecessors—and get top tips for DIY installation. and attractive. Whether you’re considering a new floor or you’re just curious about tongue and groove construction, read on for the 411 including tried-and-true installation tips if you’re planning on laying your new floor yourself. Developed in the late 1800s, tongue and groove flooring took off as manufacturers began mass-producing interlocking hardwood planks that eliminated the need for exposed nail heads had been a mainstay in wood flooring. Tongue and groove technology has expanded to include different types of flooring, yet it remains the best way to get a great hardwood floor. Here’s how it works: One side of a tongue and groove board has a protruding ridge (the tongue) that runs the entire length of the board, while the other side of the board has a groove from end to end. During installation, the ridge side of one board is fitted into the groove side of an adjacent board, creating a snug seam. 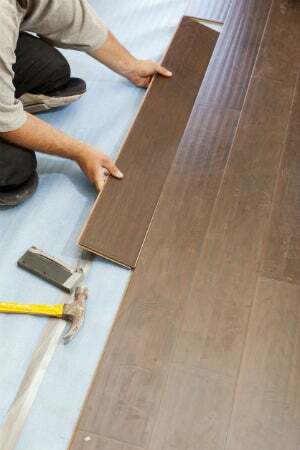 The short width sides of tongue and groove flooring planks also feature either a ridge or a groove, which creates a fully interconnecting floor when installed. Nearly all hardwood flooring today is tongue and groove because it solves the pesky problems—such as shrinking, warping, and working loose—commonly experienced by face-nailing planks to floor joists. Because the boards interlock, they’re less likely to heave or show gaps between the planks if the flooring swells or shrinks, which wood has a tendency to do over time and as humidity levels change. While smooth, level tongue and groove flooring is widespread, you still find plain board planks to recreate the look and feel of an old-time, rustic floor. Non-groove planks are rarely seen in interior residential flooring today (unless it’s part of a historical restoration project). They are better suited to exterior decking applications where a space between the planks is desirable for drainage. In the past few decades, tongue and groove flooring assembly expanded from hardwood to engineered flooring, which opened up a world of new choices for consumers. Engineered flooring features planks made from layers of compressed wood fibers, resins, and polymers, which is then topped with a thin layer of surface veneer. 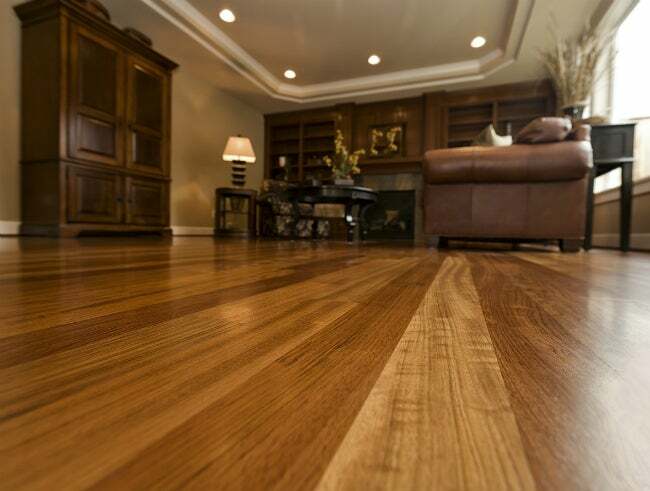 Consumers can choose from dozens of textures, patterns, and colors, including veneers made from real hardwood and bamboo, in addition to styles made from other laminate products designed to mimic the look of wood, cobblestone, or tile. Unlike hardwood flooring, engineered flooring can be installed over concrete or existing flooring, such as tile or linoleum. Although tongue and groove solid hardwood flooring does fit together, it must still be nailed to a subfloor. Engineered tongue and groove planks, however, snap together to create a “floating” floor that is not physically attached to the floor below. 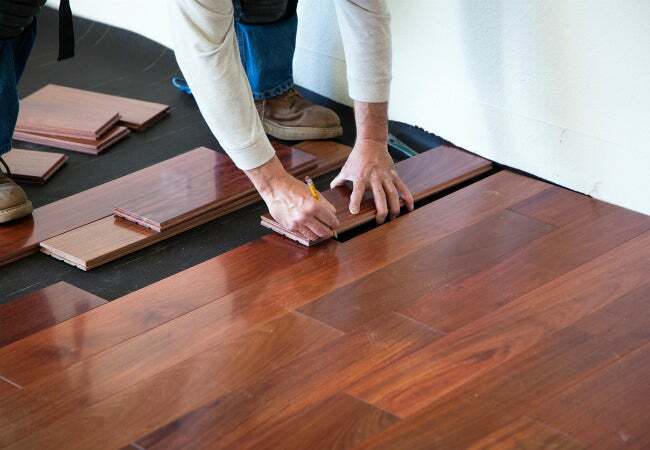 This results in engineered flooring being more DIY-friendly than hardwood flooring. Engineered flooring comes with installation instructions in every box of planks, but solid hardwood flooring, often installed by flooring professionals, does not. If you plan to install your own solid hardwood, it’s a good idea to observe the installation process “in person” before attempting to lay your own floor. • Prevent wood squeaks by using a sound-absorbing underlayment between the subfloor and the hardwood flooring. The most common underlayment is 15-lb. felt paper, which effectively muffles sounds that occur when wood rubs against wood. Skip the underlayment and you’re bound to hear loud squeaks and creaks loudly when someone crosses the room! • Rent a hardwood flooring nailer from a construction rental store to make installation easier. The traditional method of nailing hardwood tongue and groove flooring is to drive nails at an angle through the tongue of a plank and into the subfloor below, but this is time-consuming and can result in poorly inserted nails. A hardwood flooring nailer is a power tool that shoots nails through the tongue at the correct angle while driving the hardwood plank snugly against the previous plank. Hardwood flooring nailers rent for around $40 to $60 per day and are well worth the cost. • Use the underlayment specified by the flooring manufacturer. Like solid hardwood, engineered flooring requires sound-absorbing underlayment, but because engineered flooring can be installed over concrete or existing flooring, the manufacturer may recommend a cushioned polyethylene-type barrier that also resists moisture. • Snap, don’t force the planks together. The tongue ridges and groove channels are narrower and deeper in engineered flooring than they are in solid hardwood flooring. The sides of the planks fit together by positioning the tongue of one plank against the groove of the previously installed plank at an angle and then pushing downward and inward at the same time, which causes the planks to snap together. • Tap the ends of the planks together using only an installation block approved by the manufacturer. Installation blocks sell separately, and they’re designed to protect the ends of engineered planks. Attempting to tap the planks with a mallet (which is done when installing hardwood) is likely to result in damaging the end of an engineered plank. • Keep in mind that installing engineered flooring over existing flooring will raise the level of the floor between 3/8” and 5/8”. This may result in the need to cut off the bottom of a door if the floor is too high for the door to open and close easily. If the floor in an adjoining room is lower, install a transition floor threshold between the rooms. A transition threshold acts as a gentle ramp down to the lower floor to eliminate a “lip” that can cause tripping.